We are pleased to launch the Megalith 2014 Newsletter. 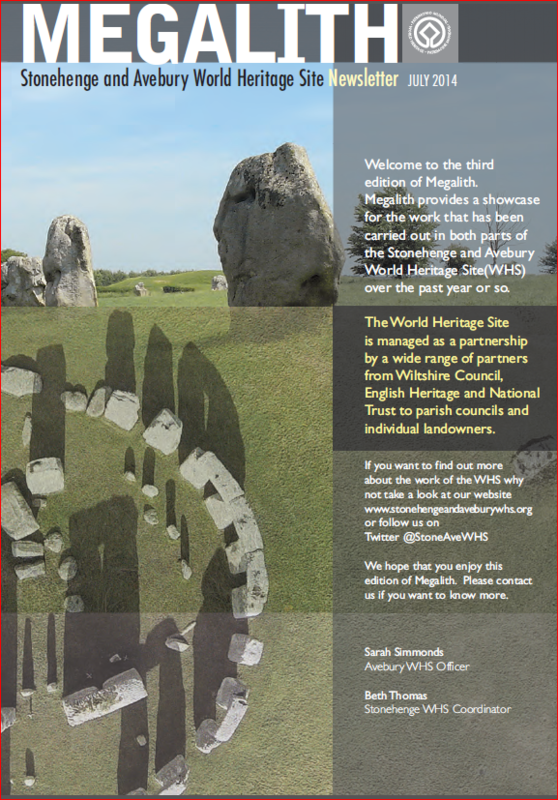 This Megalith 2014 Stonehenge and Avebury WHS Newsletter provides information on what has been happening in and around the WHS in the past year or so. 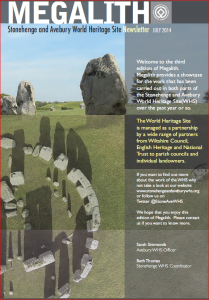 You can find out about developments in the management of the WHS such as the appointment of new Chairs for the local WHS committees and the new Stonehenge and Avebury WHS Partnership Panel and the progress of the forthcoming Stonehenge and Avebury WHS Management Plan – the first ever joint Management Plan. It includes information on a new interpretation panel at Avebury, some excavations taking place this summer on the West Kennet Avenue and events featured in this year’s Festival of British Archaeology. We have a small number of printed copies. Please contact us if you would like one.